Some historians believe, that the Byzantine cataphract was modeled after the Bulgarian, which was in turn modeled after the Sarmatian armored horsemen. In Volga Bulgaria the evolution of heavy cavlry reached its peak in the unit I am presenting here - on the right you can see a dismounted Bolgar Cataphract reconstruction and on the left my own reconstruction for use in AOK mods and modded campaigns. The unit is free to use as long as Dave3377 and I are credited. The horse is taken from his Cataphract Archer and the rest of the unit is my design. This is a really nice unit! The anchors in the north orientation of the fighting and standing are a bit off, though. Great looking unit as always.I really like the new flavor of units you bring in to the game. The attack frames can use a little more work tho. Would make a great unique unit for the Turks. I think the axe should be bigger though. Im using this as the boyar in my FE. Looks great. I'm excited to download it when I get my old desktop working again. I am actually using alot of your work for my current mod project that you might have seen in the forum discussions. If you are still going to do that campaign on Romanian history you are ofcourse free to use my Bolgar cataphract as well, but do wait 'till I update the unit, as I've recently had to change some important stuff there. The head was too skinny and the back views didn't match the front views. Since the only genuine eastern European civilisation included in the vanilla version of AOC is the Byzantines, it's no wonder that scenario designers and modders have always felt the need for unit graphics such as this one. 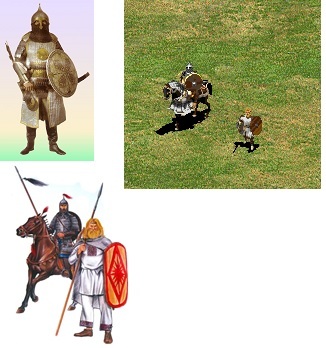 It's obvious that the author has done his research and as such his Bolgar Cataphract is very historically accurate, as can be seen from the reference image included. The uses for this unit are many, especially for people designing historical scenarios or mods set in Eastern Europe, but not limited to them. The file also includes an icon graphic, and that's always a good thing. The graphics are of overall good quality and the rider's animation graphics match those of his mount exceptionally well given the fact that this is a copy-pasted unit. However there are a few problems with the attack animation. Apart from the slightly inaccurate anchor points, the unit's axe swing can barely be seen from most angles except the front one, and the motion that can be seen of it is not all that convincing as an animation. The overall quality of the rest of the graphics make up for this problem more or less. though it would be great if this issue were to be addressed. Despite my criticism I consider this to be one of the better copy-pasted units I've seen, better even than some units that made it to The Forgotten expansion, so I definitely recommend it for designers looking to add a eastern-european flavor to their works. I still come around. I just don't have the time for mods like I used to. I scrapped the Romanian mod in favor of making a scenario in Vvoids. But that project never finished. I've tinkered with making a dark age mod with my units ever since, but I never get very far with it. I'm still holding out hope that some day I finish it.